Who Do You Want Riding Shotgun? Managing the dealership and driving its success is no easy task. With mandates coming from every direction by the state, federal government and manufacturers, the last thing you need is your DMS causing you stress. Auto/Mate gives dealerships the choice and flexibility they need to succeed in a challenging industry. 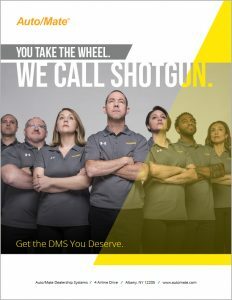 With user-friendly software, a support team with years of dealership experience and features and products that deliver value and results, Auto/Mate is the DMS partner dealers have been looking for. So who do you want riding shotgun? A confident co-pilot or an annoying backseat driver? Download our Overview Brochure and learn why this decision is an easy one. Get a free business assessment by filling out the form below.